In March 2017, Coats was sworn in as the fifth DNI, assuming the roles of IC head and principal intelligence advisor to the president. The Senate-confirmed DNI is responsible for integrating all intelligence operations in support of the country’s national and homeland security interests. In July 2018, Coats and Principal Deputy Director Sue Gordon recommended that IC leaders implement the IC2025 Vision and Foundational Priorities in line with the Office of the Director of National Intelligence’s Consolidated Intelligence Guidance for the fiscal years 2020 to 2024 budget. IC2025 efforts include establishing relationships with the private sector, accelerating acquisition procedures, developing a comprehensive cyber strategy, incorporating machine learning technology and commencing modernization initiatives on data infrastructure and management. In the same month, the ODNI launched the reorganization effort to include four new mission-focused directorates that will work on issues such as national security, cyber threats and intelligence integration. “Our comprehensive approach to transformation covered many areas, including synchronizing and streamlining processes, better developing our people, improving the efficiency and effectiveness of our decisions and aligning our structure to support those outcomes,” Coats said. Coats also said in April that the U.S. needs to ramp up the efforts to maintain the technological edge in the development of anti-satellite systems, space-based navigation and surveillance platforms to make sure several countries do not surpass the U.S. in terms of space dominance. “We have to up our game if we’re going to stay competitive…We have to become much more agile, more innovative, more creative,” Coats said. “That includes anti-satellite capabilities. We track that very, very carefully,” Coats added. Prior to his current role, Coats served as the U.S. ambassador to Germany and spent time with the Congressional armed services and intelligence committees. He returned to the Senate in January 2011 after retiring in 1999 to focus on resolving the nation’s economic issues. Earlier in his career, Coats served in the U.S. Army and worked across numerous areas in the legal sector. 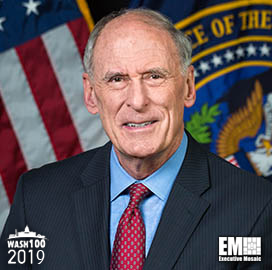 Executive Mosaic congratulates Dan Coats and the ODNI for receiving a 2019 Wash100 award.